In what has been undoubtedly the greatest Irish genealogical and heraldic fraud of modern times, Terence MacCarthy of Belfast claimed until his enforced 'abdication' in October 1999 to be a Gaelic Chief, 'The MacCarthy Mór', and also 'Prince of Desmond', head of the 'Royal Eóghanacht Dynasty of Munster'. Crucial to MacCarthy's operations was an organisation known as the 'Niadh Nask', an alleged ancient Gaelic order of knighthood in the gift of his 'dynasty' whose members supposedly wore a 'golden chain'. Is there in fact any evidence that such an order ever existed? MacCarthy's hoax was publicly exposed by the present writer and a Sunday Times article in June 1999 (for a summary account of the affair see http://homepage.eircom.net/~seanjmurphy/irhismys/maccarthy.htm). A month later the Chief Herald of Ireland withdrew recognition of MacCarthy's chiefly status, a rather belated action given that his Office's management had known for years that he was bogus. Up to this point, and largely because its Chief enjoyed the endorsement of the Chief Herald's Office, the Niadh Nask had successfully attracted a membership of over 400, some of whom were admitted gratis on account of their prestige, but most of whom paid $850 for the privilege. Thus the Niadh Nask operation may have contributed about $250,000 to the estimated $1,000,000 which the MacCarthy Mór Hoax gathered in (one source puts the money total as high as $4,000,000, which may be an exaggeration). The membership of the Niadh Nask included former Irish Prime Ministers Charles Haughey and Albert Reynolds, a number of Irish Chiefs both real and fake, the heraldic expert Gerard Crotty, the former Norroy and Ulster King of Arms John P B Brooke-Little, a brace of American military men including General William Westmoreland, and some other notable figures such as the author Peter Berresford Ellis and the academic Dr Katherine Simms (The Niadh Nask International Roll 1998, Clonmel 1998). Terence MacCarthy is himself a trained scholar and graduate of Queen's University Belfast, being dubbed by a fellow 'Chief', O Long of Garranelongy, as 'Tadhg na Leabhair' or 'Terence of the Books'. The voluminous series of MacCarthyite publications includes a collection of essays on the Niadh Nask edited by MacCarthy's associate Andrew Davison, the equally bogus 'Count of Clandermond' and indeed 'Secretary General' of the order (Links in a Golden Chain, Royal Eóghanacht Society, Clonmel 1998). Among the book's contributors is the former 'Ollamh' or Historian to MacCarthy, Peter Berresford Ellis, who lamented the 'ignorance of the realities of Gaelic Ireland' displayed by Irish historians, who were allegedly unaware even of the existence of the Niadh Nask (Links, page i). MacCarthy's contribution is a piece on the history of the Niadh Nask, which to the unwary may appear to be structured and referenced in a scholarly manner (Links, pages1-27). MacCarthy quotes from a range of sources to support his contention that the Niadh Nask had existed for centuries, having been founded by King Muinheamhoin and bestowed by kings of the Eóghanacht Dynasty, later being kept in existence by their noble MacCarthy descendants. These are all very large claims which of course need to be examined critically. What we have here is a simple statement concerning fashionable adornments, with no indication whatsoever of the existence of the Niadh Nask as a 'Momonian' or any other kind of order. The substitution of 'collars of gold' for plain 'collars' is no mere transcriber's slip, but a textual fabrication designed to give spurious substance to the existence of a 'Niadh Nask' order. 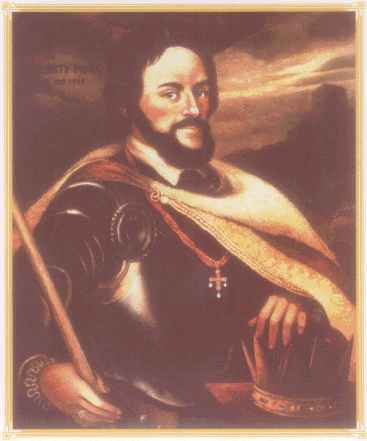 As further 'evidence' of the existence of the Niadh Nask, MacCarthy points to the below illustrated portrait of his 'predecessor' King Donal IX MacCarthy Mór, died 1596, which features the alleged cross and chain regalia of the order. At first MacCarthy represented this as a 'surviving portrait of 1568' (Historical Essays on the Kingdom of Munster, Kansas City, Missouri,1994, page 28), but more recently it is claimed to be 'an eighteenth century copy'. Rather than a genuine MacCarthy family heirloom handed down over the centuries, there are suspicions that the portrait is that of an as yet unidentified individual, or else is a recent concoction, and indeed the 'peas in a pod' resemblance between 'King Donal' and 'Prince Terence' has been commented upon. If the portrait is in fact genuine, there should be no problem getting an accredited art expert to validate it. The Gaelic word niadh means 'champion' or 'hero', while nasc means 'collar', and the two words together simply meant 'champion's collar', or figuratively a 'rallying chief'. The term was used in the latter sense in a late seventeenth-century poem by Egan O'Rahilly in the form nascnia, which MacCarthy characteristically tries to interpret as further evidence for the existence of his 'order' (Links, pages16,18). MacCarthy also cites later references to the Niadh Nask by authors such as Anthony Marmion, Canon Burke and P W Joyce, all of which appear to be developments of, or equally as imaginative as Keating's account (Links, pages 2-3, 8). Terence was so swept away by his own powers of invention that he even suggests at one point that the ancient Niadh Nask order 'may indeed have served as the prototype for the Knights of the Round Table in the Arthurian cycle'! (Links, pages 7-8). There is in fact no contemporary documentary evidence whatsoever for the existence in medieval times of an actual order of knighthood called the Niadh Nask, and the words niadh naisc or nasc nia were used descriptively or as generic terms of praise for warriors or nobles. The merry saga of fabrication was carried through into the modern period by MacCarthy, with undocumented or highly questionable assertions that the Niadh Nask survived among exiled branches of the MacCarthy family in France (Links, pages 18-22). Hence it was, according to MacCarthy, that his grandfather Thomas Donal MacCarthy was summoned to Toulouse from Belfast in 1905 and appointed MacCarthy Mór by a 'Pacte de Famille' agreed by prominent French MacCarthys, which event is absolutely undocumented of course. The effrontery continued with the assertion that MacCarthy's grandfather made King Zog of Albania a Niadh Nask in the 1930s, and the bogus Duc de Saint Bar is casually denominated as the order's French representative (Links, page 23). None of the hundreds who signed up to join MacCarthy's order appeared to have been able to see through this patent nonsense, and of course, there was no one to guide them, the Office of the Chief Herald cynically taking no action until its hand was forced in June 1999. In a replay, the Office claimed that because certain unspecified 'legal issues' have been raised, it could not take any action in the case of MacCarthy's great-uncle, 'Maguire of Fermanagh', nor in the cases of other still recognised bogus and questionable Chiefs listed on this site. Following Terence MacCarthy's abdication in October 1999, his younger brother Conor MacCarthy of Belfast 'succeeded' him as 'MacCarthy Mór'. 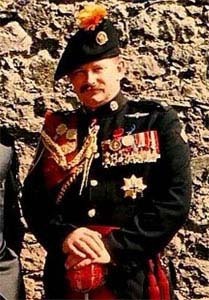 Conor MacCarthy maintains a website publicising his equally baseless royal and chiefly claims at http://www.maccarthymor.net/. The site, now removed, included Terence's pseudo-scholarly article on the Niadh Nask and a retaliatory report against the present writer, with a strong impression overall that the fallen 'Chief' remained the pen behind the throne. Interestingly enough, Terence MacCarthy's Niadh Nask article has appeared in different versions over the years, sometimes with inconsistent content. Thus an earlier version of the Niadh Nask article stated that Samuel Trant MacCarthy of County Kerry succeeded to the position of MacCarthy Mór by family agreement in 1906, although it later became convenient to represent this gentleman as one who had usurped a title rightly belonging to the Belfast MacCarthys, and to invent instead the 1905 'Pacte de Famille' yarn (article on Niadh Nask formerly at http://www2.smumn.edu/uasal/nnhist.html, now removed). The main element of the Niadh Nask insignia is a cross pommé inset with a Greek cross described in MacCarthy's time as 'either red, green or blue, depending upon the companion's division within the Order (First, Second or Third, respectively)'. Hereditary and First Division Niadh Nask 'may surround their arms with the collar, while Companions of the Second and Third Divisions may not' (Niadh Nask Insignia: A Guide to the Wearing of the Insignia of the Eóghanacht Royal House of Munster, 1997, pages 4-5). There was considerable controversy in 2001 when the Heraldry Society of Scotland reproduced McKerrell of Hillhouse's arms with the Niadh Nask/Nia Naisc insignia included, and the image was eventually amended (discussion on rec.heraldry, archived at http://groups.google.com). Again, it must be stated that the insignia of the Niadh Nask are not in reality centuries old, but like the order itself are a recent concoction. In conclusion, the Niadh Nask in all its variants is, as we have shown, based on historical fantasy and fabrication, and furthermore is so tainted by association with the MacCarthy Mór fraud that it would be advisable for former members simply to let it die away. In short, the Niadh Nask is a testament to the dishonesty and greed of its originators and to the too trusting nature not to say credulity of those who joined, as well as yet another demonstration of the abysmally low standards applying in Irish genealogy and heraldry.